If you find this device and are unaware of its purpose, please consider leaving it where it is. 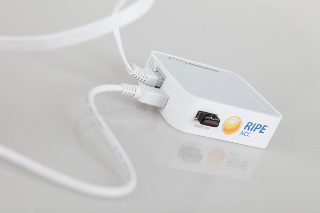 It is called a RIPE Atlas probe and it is an active measurement device that is helping to build the largest Internet measurement network ever made, in order to provide real-time data about the Internet's connectivity and reachability. It is managed by the RIPE NCC and it does not provide us with any information whatsoever about the content of websites visited or any other private information about the host's network. If you send us the 12 letters/numbers printed underneath the bar code (the MAC address of this device), along with a description of where you found the device, to atlas [at] ripe [dot] net, we will try to provide you with some information about how and when this device was installed. We invite you to learn more about RIPE Atlas.